LIFE AT THE WITCH TRAILS is based on the idea of creating “living“ structures through sound. 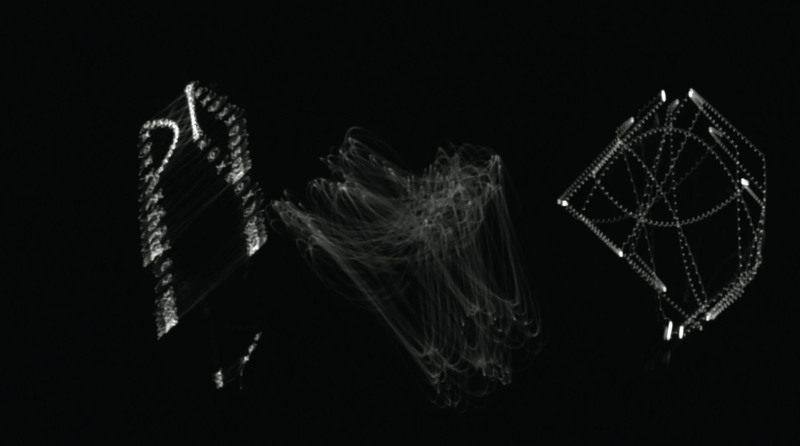 Video material from x/y-stereo displays visualizes the phase changing from two-channel audio signals. The sound source is a special audio composition that cannot be realized without direct visualization. It contains full-on, sound-dependent motion dynamics and forms complex “cathode-ray objects,” which allow direct (not delayed) visual access to the smallest details of the composition. The representation is not limited by the pictures-per-second time frame of television and computer technology. The interconnection of the aural and visual senses arises in an immediate way, and the visualization of sound obtains a new meaning. This project has its roots in the works of the abstract filmmaker Oskar Fischinger, who created several works on the topic of visual music in the 1920s and 1930s and was connected to Alexander Lazlo, a pianist who explored color and music. Fischinger used multiple overlapping projected images at live multimedia concerts in the 1920s. As a counterpoint, there are the drawings of the Belgian poet and painter Henri Michaux, who worked on the topic of “language” in his poetry and sometimes focused on “asemic writing” under the influence of hallucinogens.